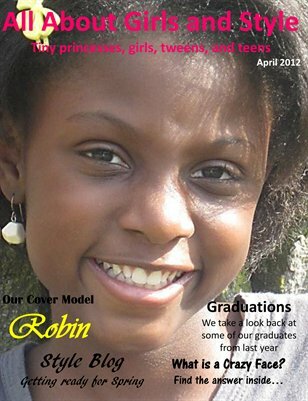 Welcome to the second edition of AAGS (All About Girls and Style) April 2012! This month we're featuring more Style Blog, Taylor's Cooking Corner, a wonderful book review from Robin, What Friends Do, and much more. This magazine showcases a young teenage girl's love for designing along with her love for fashion, style, fun, family, friends, taking pictures, and other cool stuff. She wanted to display this in an entertaining yet appropriate way for the eyes of girls like herself. It's a magazine for tiny princesses, girls, tweens, and teens. We're sure you'll enjoy what you'll see.